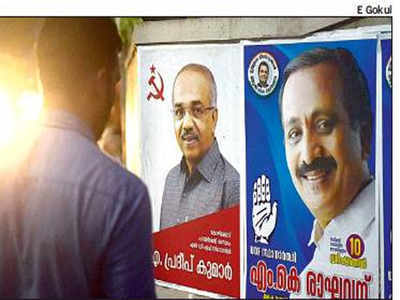 KOZHIKODE: For decades, the state’s political parties and candidates have been trooping to the country’s famed printinghub of Sivakasi in Tamil Nadu to print their multi- colour electionposters in bulk every election. But in a trend reversal of sorts, the state’s home-grown printing industry-which has seen massive capacity expansion and technology adoption over the years-has mounted a stiff challenge to the printing Goliaths across the border. As per industry estimates the state’s printers-numbering around 4,000-are set to bag over 60% of the state’s election printing orders this time, thereby breaking Sivakasi’s long-standing stranglehold in the state’s election campaign material printing market. For instance, the election posters of the UDF and the LDF candidates in Kozhikode parliament constituency have been printed in printers based in the district alone. “We have entrusted all poster printing orders to local printers as now they have the technology and quality matching that of Sivakasi. Also, the rates are not much different when we consider the transportation costs,” a person attached to the campaign of UDF Kozhikode candidate M K Raghavan said. Kerala Master Printers Association (KMPA), which represents large-scale printers in the state numbering around 125, said that printers in the state has been able to almost match the price advantage earlier offered by Sivakasi printers. “Now, we are doing over 60% of the election poster orders from the state. Earlier, over 80% of the election poster-printing orders from the state used to go to Sivakasi and we have now been able to bring it down to half. Still, some are giving their orders to Sivakasi based on the notion that printing costs are cheaper in Sivakasi. On the quality front, we are far ahead and now the most advanced printing equipment and technology are available in the state. Now, our presses can print around 15,000 copies per hour,” Biju Jose, general secretary of KMPA, said. He added that the state’s printing industry is expected to get orders covering around 70% of the Lok Sabha election poster business by the time the season is over. Kerala Printers Association (KPA), the umbrella organisation of around 4,000 printers in the state, has said printers from Sivakasi have deployed commission agents in the state to canvass for orders and the association has asked for strict implementation of EC norms regarding mandatory mention of number of copies and details of the printer in the posters. “We will be giving representations to district collectors to ensure that the posters and pamphlets should be printed in recognized printers only,” KPA state president P A Augustine said.